Cuts and scrapes in young children are fairly common. If your little one falls down and cuts himself there is no need to panic. Most cuts are superficial and minimally harm the outer layer of skin. When this occurs a hug, kiss, and proper cleanliness of the affected area with soap and water, is the best way to console your toddler. In some cases, a fall or sharp object might provoke a deeper cut. If this occurs, remember to stay calm. The following tips will help you care for the cut properly while identifying if there is need to contact your doctor or go to the emergency room. Apply pressure to the affected area to stop the bleeding. Certain body parts are more prone to bleed (for example, the head) and require applying pressure for 10 minutes. After applying pressure, thoroughly wash the cut with soap and warm water. If you consider it necessary, apply an antibiotic cream recommended by your doctor to the cut. Cover the cut/scratch with an adhesive bandage or gauze if needed. If the wound is large or gets dirty, clean it every day, apply ointment and cover with a new bandage/gauze. When a scar forms, leave it to heal without cover. How often should I give my baby a bath? Until your baby is not up and moving around the whole house, a daily bath is not necessary. The American Academy of Pediatrics recommends bathing your baby about 3 times a week during the first year of life, to prevent dry skin. Our little ones have very delicate skin that’s lubricated for their protection. However, around the world many cultures have the custom of daily bathing. Every parent knows how much his little one sweats or gets dirty, so it’s best to decide bathing schedules according to their instincts and their doctor’s recommendations. In some cases, pediatricians will suggest that you bathe your baby every day, especially if the weather is very humid or hot. Now, whether you decide to bathe your baby every day or not, you must always make sure to keep the diaper area clean after each change. Likewise, you must take extra care of the neck area and all body folds; these areas sweat, and dirt and lint accumulate in them. Pass a damp cotton cloth through his folds to ensure that you have a clean and happy baby! Bath time is a pleasant and relaxing time for your baby; its purpose is not only hygienic. The bath is an excellent start to a bedtime routine! Try to make it a quiet time without concerns, it will help your baby eventually recognize that it is almost time to go to sleep. Just remember not to bathe your baby just before or after eating because, on one hand, a hungry baby is less likely to cooperate, and, on the other, the movement can cause reflux. Finally, a bath should be a time of relaxation and tenderness; don’t forget to give him a lot of love. It is very common for your baby to cry or show resistance to water the first few times, since it is something very new. Make sure you offer support, love, and a sense of security to make the process less upsetting. At first, baths will be uncomfortable for your baby. You take off his clothes so he feels cold, and then you get him wet without his permission! This can scare or startle him, causing an uproar. 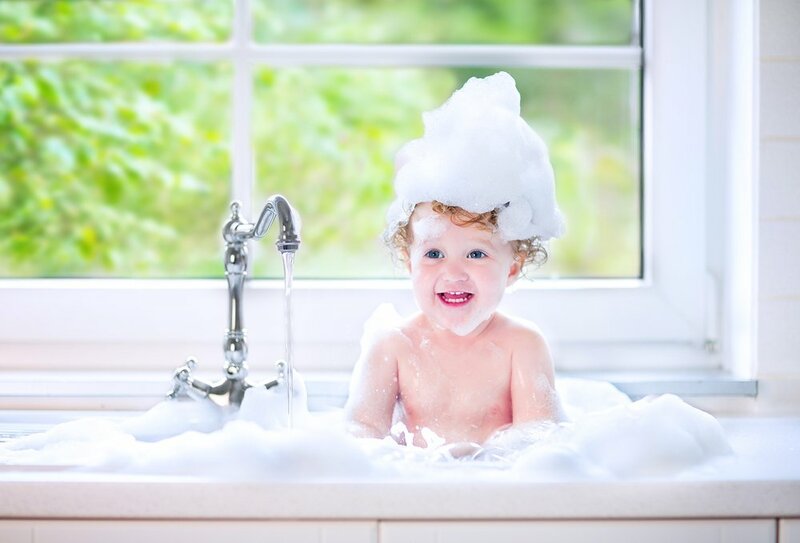 It doesn’t always have to be so, if we strive to make bath time as comfortable, relaxing, and fun as possible, our children will learn to enjoy it. Sing to your child while you bathe him. He will surely love it and it will increase his musical and language skills! Talk and guide him through the process. You can tell him a story or simply talk to him about what you’re doing. Use baby talk, children like it a lot and benefit from its intonations! 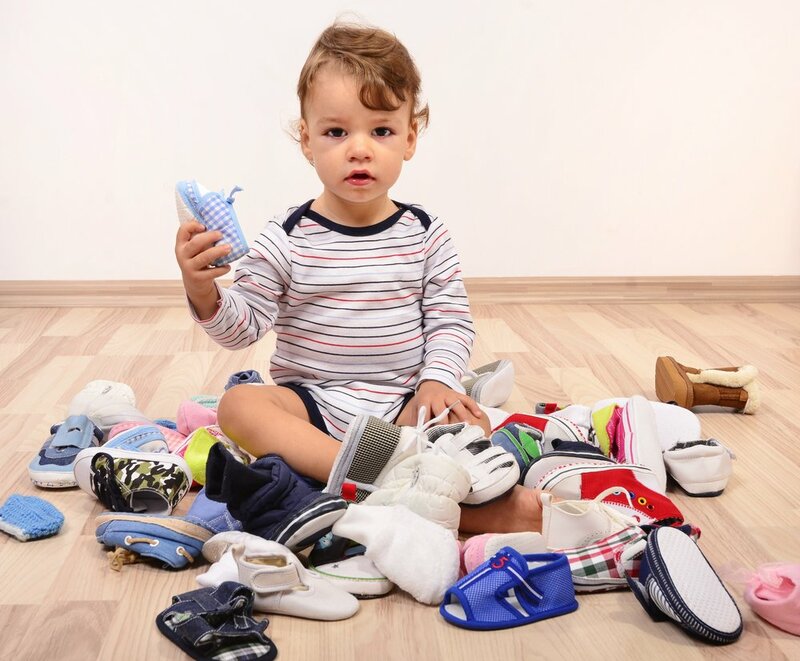 Continue to stimulate your baby’s language by naming each body part while you clean it. You can use funny voices to make it more interesting. Don’t forget to show a lot of affection! Finally, try to bathe your little one at the same time every day so that he begins to get used to a routine and anticipate it. Despite the fact that children’s teeth are not permanent and that they’re going to fall off eventually, it is very important to take care of them since they first appear. Your baby’s teeth will form his mouth, help him chew well, and speak clearly. Teeth normally appear starting with the first two lower front teeth. The first tooth may come out between your baby’s 6th and 10th month, and as soon it appears, it requires special attention and care. You may be wondering if you need to take your baby to the dentist since the appearance of his first tooth. Experts have many different opinions about this; however, they agree that before he’s one year old, your baby must have his first visit. With this in mind, you can decide to take precautions at home before taking your baby to the dentist. How do I care for my baby’s teeth at home? When the first tooth appears, buy a toothbrush for babies, making sure the bristles are extra soft. To wash his teeth, use a pinch of fluoride toothpaste, no bigger than a grain of rice. Gently pass the toothbrush through your child’s mouth, cleaning his small teeth very well. Don’t worry about rinsing his mouth, just make sure that you use very little toothpaste and it won’t be a problem. Brush his teeth twice a day, once in the morning after breakfast and once in the evening after dinner or his night feeding. Finally, don’t let your baby sleep with a bottle of milk or juice in his crib; this can lead to many cavities. When your child is almost 2 years old, he’ll probably have many teeth that allow him to bite and articulate words. Maybe all of his teeth haven’t come out yet, but they will appear soon enough. At this stage, the canines, commonly known as fangs, are due to come out and he will flaunt a beaming new smile! Babies’ teeth, also known as milk or primary teeth, are temporary. As he grows, your little one will lose them to leave space for his permanent teeth. The fact that they are temporary doesn’t mean that we can neglect them. On the contrary, just like permanent teeth, milk teeth are subject to decay and dental infections if they are unattended. Also, keep in mind that teaching children healthy hygiene habits at an early age will help promote cleanliness in the future. You’ve been taking care of your little one’s teeth and now it’s time to take the next step. It’s time to teach your child to spit after brushing his teeth. Tell him that after he washes his mouth, he has to spit out the toothpaste. Show him how to do it and then ask him to imitate you. Instruct him to spit only in the sink, after he’s done brushing his teeth. Avoid giving him water to rinse out his mouth, because at this age he’s more likely to swallow it that spitting it out. Practice this new habit daily. Your little one will probably want to take control of the toothbrush, and that’s very good! Start teaching him the proper movements by holding the toothbrush together and brushing from top to bottom throughout his mouth. 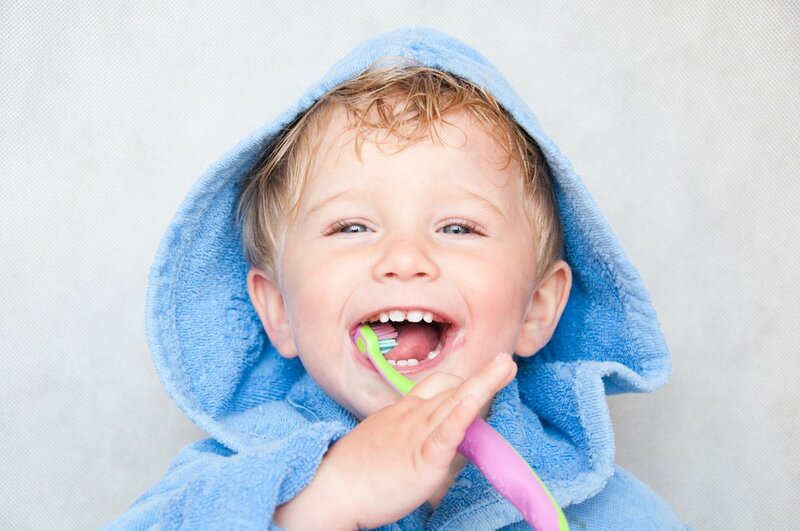 Don’t expect your toddler to master brushing his teeth immediately. It will take time for him to learn the right moves. That’s why it’s very important that you always accompany him and remind him how to do it. Remember to make washing his teeth a fun and engaging activity, and to let your child watch you wash your teeth, because children learn through imitation.